Tonya is an active dog who enjoys going for walks. She also loves to romp around with her many toys and to take dips in her swimming pool. She loves to play fetch, to do nosework (a fun search and scenting sport for dogs) and to play tug as well. 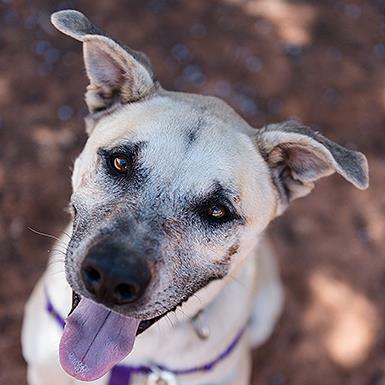 Tonya has enjoyed play group time with other dogs at the Sanctuary, but she is currently unable to live with other dogs here due to her tendency to guard things like her water bucket, pool and the gate of her yard. During her assessment at Dogtown, she also guarded a high value treat from people. Tonya will need to find a home with a secure yard, as she has escaped from a four-foot fenced yard in the past. Although she has hip dysplasia, she is very strong and will chase small animals like lizards on walks. At the Sanctuary, Tonya is working on loose leash walking and being calm for harnessing. She is also learning to stay calm at feeding time. Tonya would make a great adventure buddy for someone. She'd be a great hiking partner, especially if you enjoy hiking near water.